I want to disable autocomplete login details when i am click on administrator login. I tried autocomplete ="off",oncopy="return false" onpaste="return false" but nothing work. I know it's a browser property but i need to do this clear website audit. i seen this kind of validation on payment gateway. 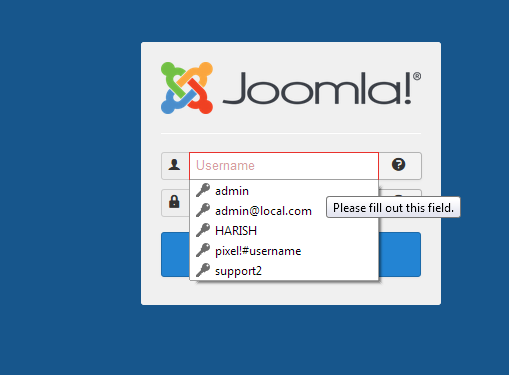 Despite it is not a Joomla question, it is still could be a relevant question in many area in Joomla Forms too and can be applied in Joomla, so I try to give a useful working solution (which I've found among a lot of nonworking and old solutions). it's relatively simple at the end. (create a backup copy of this file to somewhere before edit that, then if you screw up something you can just place back that original file in place) Or, actually the right way is to create a template override of this module default.php file in the template manager of the admin. And that's it, it worked for me without a problem and I could signed in to my admin without problem, autofill was not ignited in the browser (I tried this on Chrome and on Firefox). I hope that it will work for you too and you can confirm this for me at your side. (it still could be simplified a lot, but at least it works now). Firefox - Autocomplete is not ignited and the Joomla authentication works too. It's the same in Chrome.